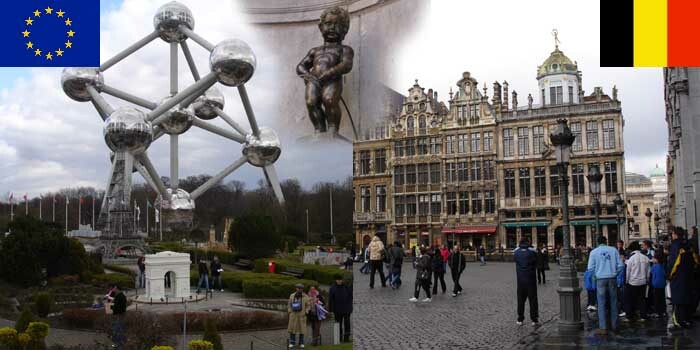 Some of the sights of Brussels. On our way back from Amsterdam six months before, Hanne and I saw a sign on the autobahn for Brussels, and thought that this might be an interesting idea for a weekend trip. So, for our last weekend together before my second deployment to the Middle East, we went to Brussels. We made a short stop at Bastogne on the way to Brussels. And, while I welcomed the snow in Bastogne for its historical significance, I was less than amused that it had decided to follow us to the capital of the European Union. Even though our first night was wet and cold, we made the best of it. At least the hotel was worth the cost of 100€ per night. As you can see from the photos, it was lavishly decorated, if not a little bit overboard. This, coupled with the fact that it's perfectly situated just around the corner from the Grand Place, made this hotel a great place to stay. Hanne making the best of the bad weather. We walked around for awhile, got some pizza next door to the hotel, and called it a night. The next morning we ventured out to find the Manneken Pis, which is a bronze statue of a 2-year old boy made in 1619. We walked a bit more, and then hopped the metro to see the Atomium and Mini-Europe. The Atomium is a massive structure built for the 1958 Brussels' World Fair. Although the lines were too long to waste the time to go inside, it was worth seeing in all of its grandeur from the outside. Since I build models, we couldn't pass up the opportunity to visit Mini-Europe. This park features 1/25th scale models of some of the most significant structures built by man over the centuries. The detail on some the buildings was stunning. Take a close look at Big Ben, the Arc de Triumph, and the Abbey of Melk. After a long day of adventuring, we chose one of the many restaurants near the Grand Place to have a seafood dinner. We don't think we'll be going back to Brussels anytime soon, with so much of Europe left to see. But we did have a lot of fun, and will remember our trip as one of our unique adventures. Hanne and I at Mini-Europe.